In The News - Pacific Modern Homes, Inc. 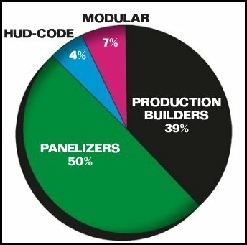 Per the graph above, from Automated Builder Magazine, 50% of the homes built in America in 2009 were panelized (many by PMHI) and 39% of the homes were job site built or stick built. IF SOMEONE TELLS PROSPECTIVE HOMEOWNERS they can assemble the key pieces of a beautiful custom home in just hours, most stop in their tracks and ask how. And when they learn about a remarkable panelized wall and roof truss system that saves time as well as money, most ask where they can sign up. According to the National Association of Home Builders, more Californians than ever before are purchasing panelized building systems to build homes and other structures. The process begins in a climatecontrolled facility where skilled craftsmen carefully construct a home’s essential structural components from raw materials into perfectly sized panels. Upon completion, the panels are loaded onto a truck for delivery to the site. With the help of as few as four laborers, the walls pop up with windows intact, room dividers in place, and trusses ready for the roof. 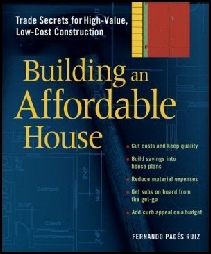 Building an Affordable House is a very useful book, full of examples and suggestions about how to build your new home more economically. So, why would we suggest this book? Simple, one of the construction techniques suggested is the use of wall panels and roof trusses. 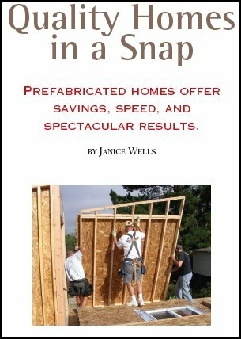 The author, Fernando Pages Ruiz, even goes so far as to predict, "Prefabrication is the future".